As we approach the end of another year, it’s time to start looking forward to what’s in store for Adventures in Odyssey in 2016… and that news is already beginning to surface! Right before summer begins in 2016, be watching for a new compilation collection featuring popular vacation episodes. 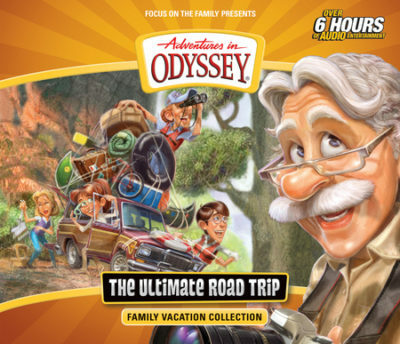 The Ultimate Road Trip: Family Vacation Collection releases in May, in addition to other releases throughout the year. Watch our blog for more news and happenings in 2016 regarding this and other exciting Adventures in Odyssey news. You can learn more about this upcoming collection here at our new product page. Special thanks to the AIO Update for finding the cover art first. What are your thoughts on the cover art? This is a very appealing illustration and package design, and we’re excited to see what you have to say… down in the comments below!